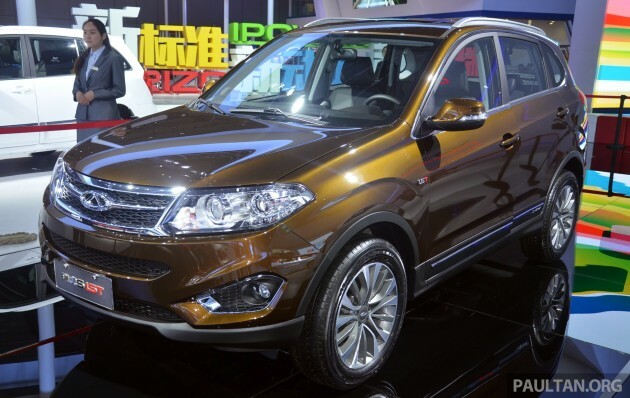 Another debutant at Auto Shanghai 2015 is the Chery Tiggo 5 1.5T. The SUV itself isn’t exactly new, of course, being a more upmarket and bigger version of the Tiggo 3. Note that the Tiggo sold in Malaysia is the Tiggo 3, although ours is the original; in China, the Tiggo 3 has already gone through two facelifts. The Tiggo 5 version comes equipped with the TCI 1.5 litre turbo DVVT engine that’s available on the Arrizo 7 sedan, and joins the 2.0 DVVT motor already on offer. Allied to a seven-virtual ratio CVT, the powertrain claims to yield a fuel consumption of 7.2 litres per 100 km, as well as produce 152 hp and 205 Nm of torque. A five-speed manual is also available. Features include projector headlamps with LED DRLs, 18-inch alloys covered in 225/60 rubbers, C-shaped LED tail lamps, leather seats, a seven-inch touch-screen with reverse camera and navigation plus keyless entry and start on higher variants. Four variants of the manual are available, priced between 99,900 (RM58,200) and 120,900 yuan (RM70,400) – CVT variants and prices have not yet been revealed at the time of writing. mate…for every one year proton goes through, the chinese are moving 2-3 years faster. Kid… Proton are Global DrM says. China car only good in China. Proton and DrM the best. Don’t support and you’re racist ! and DrM don’t racism. Interior looks amazing to be honest, although you can see that some bits are “inspired” from other cars. As much as I love Proton, why can’t they make a interior this good looking? Proton is always doing OK with exterior but not really for interior. Not trying to bash Proton or what but it’s surprising to see how fast a few of the big China car manufacturers (not those copycat ones) progress in such a short time. proton always brag with their ride and handling only. which is not what the market wants. thats why they cant sell many cars in foreign market. Yeah. Make it like toyota peridua here. Coffins moving on the roads. The most impirtant thing is money. Safety comes last. Taste lah bro. Kalau local design the interior, it will look like kampung car no matter what material they use. The Tiggo 3 is going after the leading but aging GWM H6 with the same 1.5T engine capacity. I must say there is huge improvement in the finishing & plastics used compared to the 1st generation mainly because most auto part manufacturers in China have shifted to using ABS & high quality plastics for moulding since they are also supplying parts to foreign makes. The local China auto brands benefited from this. The 1st generation Cherry introduced here really reinforced most local perception of cheap China brand as flimsy parts & poor plastics were breaking off under our hot sun climate. GWM on the other hand introduced a more updated vehicle with parts on par with foreign makes. Having driven the GWM M4 for the last four months, its one solid performer for a small vehicle category. Looking forward for this Tiggo 3 to arrive in Malaysia. Hopefully by then the local GWM have sorted out their management & business issues to have the H6 available for driving comparison. That’s true.. The GWM Haval M4 is a revelation. NVH is pretty good compared to local cars, fuel economy is pretty good too. Having an engine that’s licensed from Toyota helps, I guess. Perhaps it is true after all that Chinese cars will be the next Korean cars. They are perhaps at the level of where Hyundai was when they came out with the Sonata NF. People started taking notice because the designs no longer quirky and the build quality was improving. They started becoming a viable alternative to Japanese cars even if they’re only slightly cheaper. Soon, these Chinese cars will be viable alternatives to Korean cars.. SHUT UP, AND TAKE MY MONEHH!! I think I wouldn’t buy chinese except for roast duck and pork roast, but this Tiggo looks pretty good. Could it did head-to-head battle with cabbage Toyota Rush? My friend bought Tiggo in Labuan 5 years back. 3 months later, aircon broke down. 1 1/2 years later, gear box broke down. 2 years – over heat if drive more than 30 minutes power window also not functioning. 3rd years corrosion found everywhere. leaking at rear roof. short story: avoid this bloody car at all cost. as Jackie chan once said: china will explode. Korean and Jap cars also got this problem. It just some isolated case. If it happening in bulk, then its the car manufacturer problem. Many china bikes and cars performed very well in Western and Middle East, why Malaysia always got negative perception? If you think cheap, you get cheap. Previous Post: 2016 Toyota Hilux leaked – to be launched next year?